Moving in now, and opening in the 34th Street district on Monday, October 28th at 11am? 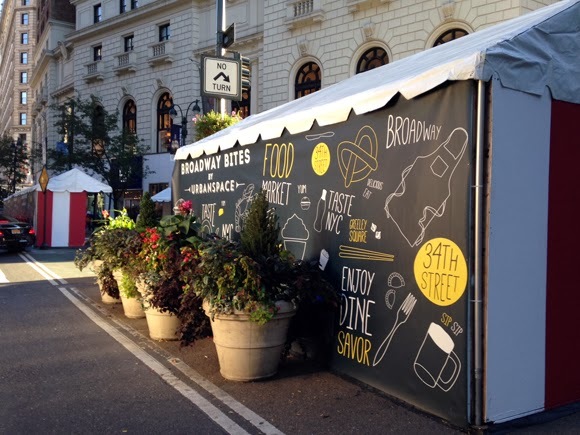 Broadway Bites, UrbanSpace's brand new food pop-up market in Greeley Square! Check out UrbanSpace's website for more information, but expect fabulous comfort food (think lobster chili, lentil and ginger stew, and gouda grilled cheese, mmm) and so much more. This culinary market will be open 11am-9pm from next Monday through Sunday, November 24th. Stay tuned for more info once the market opens, and be sure to use hashtag #bwaybites when you're Instagram-ing your lunch. See you on Monday, Midtown!